Between Dr. Google and the web-patient: How can medical students be prepared effectively for the task of online counselling? The internet keeps gaining importance in health care [1,2]. Searching for answers to medical questions, patients and laypeople increasingly use the internet to communicate and to get access to health-related information before and after (or instead) consulting a doctor [3,4]. At the same time more and more players offer information and advice online. Since medical knowledge is often complicated and difficult to assess, medical professionals are in demand to adapt to the changing social and technological situation - especially for preventive reasons. On the one hand, doctors are supposed to communicate with highly as well as inadequately informed laypeople in a professional manner to increase patients' adherence. On the other hand, they should be able to provide reasonable orientation and guidance in online settings and use the possibilities of the internet effectively [5, 6]. Skilled online communication can provide a useful complement to traditional doctor-patient communication, if it meets equal standards. But as especially text-based online communication differs strongly from real-life doctor-patient interaction (e.g. anonymity, lack of audio-visual cues), its reliability is often doubted. Studies showed that medical doctors are aware of the demand, but unsure about online patient communication (e.g., professional reasons, data protection, payment). They frequently stated to require better preparation for online consultation. Therefore, the quantity and quality of accessible information, specific characteristics of computer-mediated communication, as well as legal concerns and risks create new challenges for doctors’ communication skills [7, 8] that need to be met. Besides a change in conditions and attitude concerning this topic, adequate training options are essential to develop skills for information exchange and doctor-patient relationship building in online settings. Our study focuses on the question, how medical students can be prepared effectively for the described challenges of professional web-based communication and the task of online counselling. ► Does an online forum provide an effective training tool/environment for online counselling? ► Which didactical approach is suitable to frame the individual training with the online forum? Therefore, we developed a simulation training program, involving a realistic, purpose-built online forum and virtual patients as vital components. We integrated the training in the gynaecology clerkship (9th semester) as an add-on. 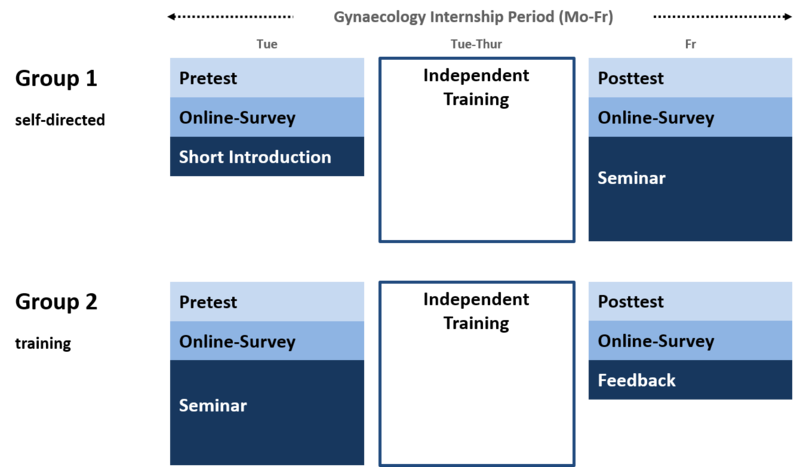 The individual counselling activities within the online forum were embedded in a four-day blended learning course concept (Figure 1). N=78 students attended the course in groups of n=9-10 students each, focussing either a self-directed approach (G1; n=39) or a teacher-directed approach (G2; n=39) with more information and time for group discussion in preliminary seminars. We used freeware (phpBB) to build the forum with individual sub-forums for each participant in the training, thus facilitating a protected environment. We installed fictitious patient vignettes with different profiles (e.g., age, patient history) and pre-defined enquiries of varying complexity (e.g., given information) in all sub-forums to be answered by the respective course participant (Figure 2). All patient cases dealt with mammography screening. In this prospective randomized parallel group trial we evaluated course concept, online forum and effects on students’ communication skills qualitatively and quantitatively by questionnaires and pre-/post-tests (OSCE with checklist, independent raters; self-assessment). Santana S, Lausen B, Bujnowska-Fedak M, Chronaki C, Kummervold PE, Rasmussen J, Sorensen T. 2010. Online Communication between doctors and patients in Europe: status and perspectives. J Med Internet Res 12(2):e20. Hewitt-Taylor J, Bond CS. 2012. What e-patients want from the doctor-patient relationship: content analysis of posts on discussion boards. 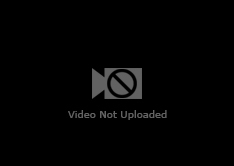 J Med Internet Res 14(6):e155. Van de Belt TH, Engelen LJ, Berben SA, Terenstra S, Samsom M, Schoonhoven L. 2013. Internet and social media for health-related information and communication in health care: preferences of the dutch general population. J Med Internet Res 15(10):e220. Wald HS, Dube CE, Anthony DC. 2007. Untangling the web – the impact of internet use on health care and the physician-patient relationship. Patient Educ Couns 68(3):218-224. Ellaway RH, Coral J, Topps D, Topps M. 2015. Exploring digital professionalism. Med Teach 1:1-6. Donnelly LS, Shaw RL, van den Akker OB. 2008. eHealth as a challenge to 'expert' power: a focus group study of internet use for health information and management. J R Soc Med 101(10):501-506. Weiner JP. 2012. Doctor-patient communication in the e-health era. Isr J Health Policy Res 1(1):33. The sample showed a gender distribution of 61% female, 39% male students. Two thirds of the participants were between 23-26 years old, a larger number (9%) over 31 years. 84% indicated German as first language. Statistical analyses revealed no significant socio-demographic differences between both groups. 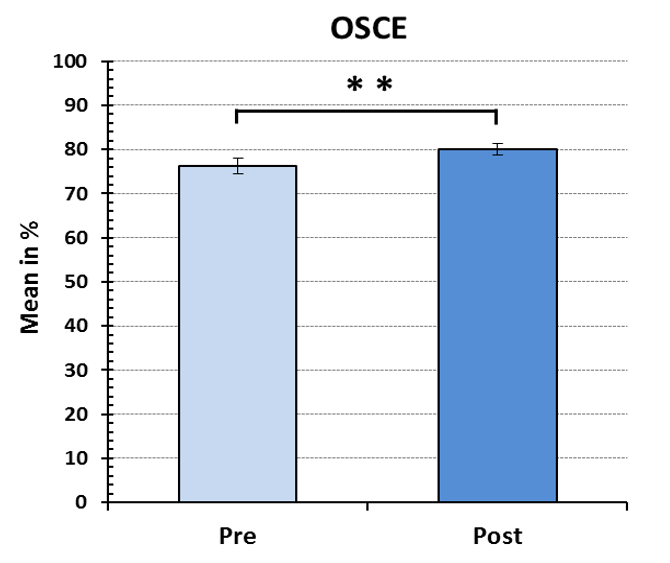 OSCE pre-/post-tests were rated by two independant raters (substantial agreement: k between 0.6-0.88). 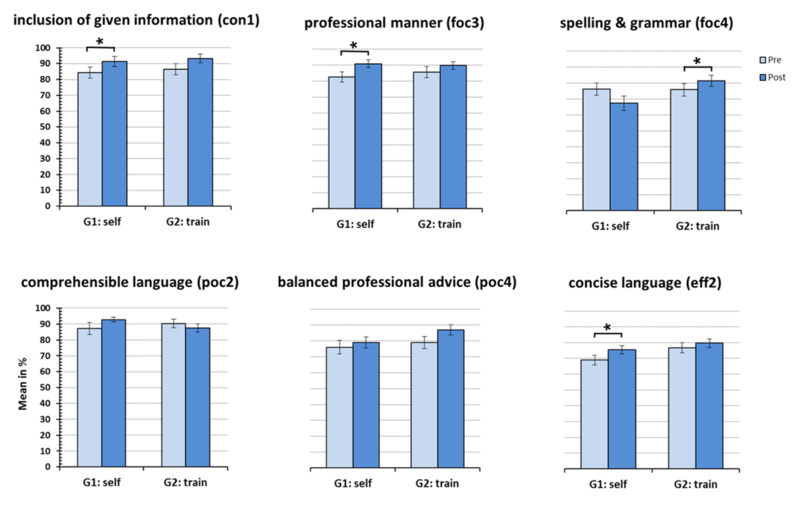 The result showed a significant increase in counselling competence in both groups (p<0.01) (Figure 3). The areas of improvement varied between groups. Students in G1 improved in professional tone, conciseness and understandability, students in G2 enhanced in formal aspects and balanced advice (Figure 4). According to these results, the students reported an increase in individual communication skills. In the self-directed group (G1), students realized a significant gain, both in doctor-patient communication and in professional online communication (p<0.05) (Figure 5). Students in G1 answered more fictitious patient enquieries and indicated a higher activity in online information search during their independant training time. Evaluation results showed, that students in both groups were satisfied with the online forum as a training tool (79%) and the course concept (87%). Free text quotes revealed high relevance and topicality, as well as uncertainty with the web-based doctor-patient communication. The online forum was described as innovative and effective. The students wished for more patient cases from various fields and more feedback. ► An online forum offers a realistic and flexible setting for simulating online counselling (e.g., adaptation of difficulty, individual or mass communication). It appears uncomplicated in implementation (e.g., cost-benefit-ratio, preparation, handling). ► The blended learning approach in combination with online forum and virtual patients provide a basis for an effective training program and an innovative addition to traditional communication trainings. It is suitable to enhance students' online consultation competencies. The degree of self-directed work can be chosen depending on objectives (e.g., focused advice) and need of target group. ► Students report, that having to deal with online communication in a professional context creates an awareness of relevance, risks and chances. ► The approach is a promising first step towards establishing an effective program to meet the challenges of online counselling. It may be applicable for other medical disciplines and training levels. The study was carried out as part of an interdisciplinary research collaboration. The ScienceCampus Tuebingen is organized in 8 clusters and 27 sub-projects. It bundles expertise from several disciplines (e.g., medicine, psychology, educational research, media science).